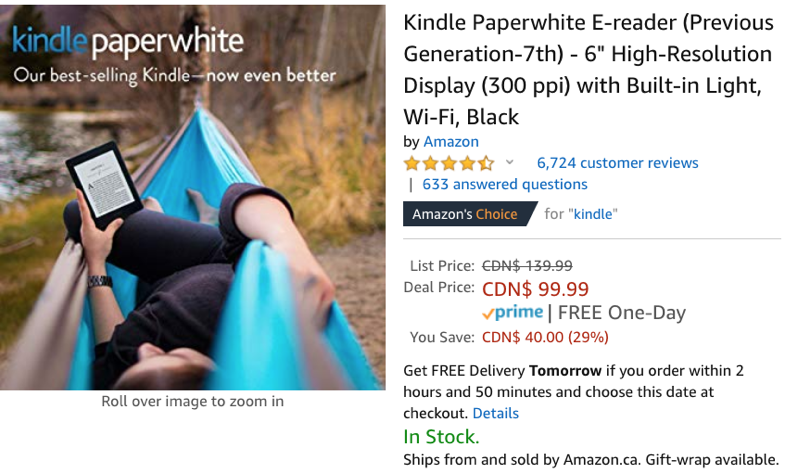 Amazon recently launched an all-new waterproof Kindle Paperwhite (our review is coming soon), and because of this, it’s now putting the previous 7th-gen model on clearance, slashed by $40 to $99.99 (29% off). What’s the difference between this 7th-generation Kindle Paperwhite and the new 2018 Kindle Paperwhite? The 7th-generation model is not waterproof, but if you’re only reading indoors, it shouldn’t be a problem. Also the newer 2018 model has bumped up storage with 8GB and 32GB options, while the 7th-gen only has 4GB. But e-books, in general, are fairly small in size, so 4GB should still be plenty (plus you can delete and redownload titles from your Amazon account). The 2018 model is also slightly thinner (0.3” vs 0.36” 7th-gen) and shorter at 6.6” tall (6.7” for 7th-gen). Both devices still have the same front-lit 6-inch “Paperwhite display technology with E Ink Carta and built-in light, 300ppi, optimized font technology, 16-level gray scale.” The newer model is also 14g lighter. If you’re trying to find an excellent Christmas gift for that bookworm in your life, a Kindle Paperwhite will do you well. Click here to jump on the 7th-gen Kindle Paperwhite sale while it’s still available.